Byron Au Yong (歐陽良仁) composes songs of dislocation prompted by a broken lineage. 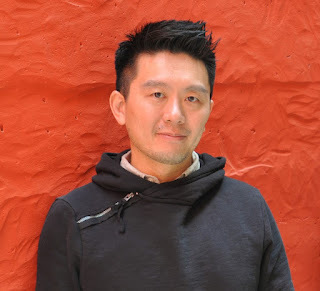 Born to Chinese immigrants in Pittsburgh and raised in the Pacific Northwest, his upbringing informs a creative process that examines the contradictions between the American Dream and sustainability. Variety calls one of Au Yong’s musicals “claustrophobic and expansive, intimate and existential, personal and political all at once.” The Seattle Weekly says that his “interdisciplinary works are as exquisite and imaginative as they are unclassifiable.” Dedicated to intercultural collaboration, Au Yong creates across disciplines with an attention to the ways people connect with the places they call home. Examples include Farewell: A Fantastical Contemplation on America’s Relationship with China, choreographed by Donald Byrd for Spectrum Dance Theatre and Stuck Elevator, libretto by Aaron Jafferis, directed by Chay Yew, premiered at American Conservatory Theatre with performances at Long Wharf Playhouse. Multimedia installations such as Piano Concerto–Houston, for 11 pianists, commissioned by the University of Houston Cynthia Woods Mitchell Center for the Arts and YIJU 移居 (to migrate) for the Jack Straw New Media Gallery combine local and global currents as well. Site-responsive projects include Kidnapping Water: Bottled Operas, for hiking opera singers and water percussionists, performed in 64 waterways throughout greater Seattle, TURBINE, commissioned by Leah Stein Dance Company and Mendelssohn Club of Philadelphia for the 200th anniversary of the Fairmount Waterworks, Occupy Orchestra 無量園 Infinity Garden, influenced by Chinese gardens, John Cage and Occupy Wall Street, performed by the Chicago Composers Orchestra in the Garfield Park Conservatory, and Welladay! Welladay! Wayward Love Songs, text by James Joyce, for voice and piano trio, performed in a former home for orphans and unwed mothers. International projects include Salt Lips Touching premiered outside a Confucian Temple at the Jeonju Sanjo Festival in South Korea, Edge performed at the Hochschule für Musik und Theater Hamburg in Germany and Forbidden Circles performed at the Fukuoka Gendai Hogaku Festival and International House of Japan. Moreover, he has worked with the top taiko ensembles in North America including Ōn Ensemble and TAIKOPROJECT. In addition, he curated the exhibition A Bridge Home: Music in the Lives of Asian Pacific Americans for the Wing Luke Museum, where he serves on a Community Advisory Committee. Au Yong holds degrees in musical theatre writing, dance studies and music composition/theory from NYU, UCLA and the University of Washington. He has been artist-in-residence with the Asian/Pacific/American Institute at NYU, Center for Migration and the Global City at Rutgers University, International Festival of Arts & Ideas, Montalvo Arts Center, TheatreWorks Silicon Valley, Westminster Choir College, Weston Playhouse, Sundance Institute Theatre Labs, Virginia Tech Center for the Arts, and Yale Institute for Music Theatre. Honors include a Bay Area Theatre Critics Circle Award, Creative Capital Award, Ford Foundation Fellowship, and Time Warner Foundation Fellowship. Internationally, Au Yong has received support from Aldeburgh Music in the UK, the Dragon Foundation in Hong Kong, the Darmstadt Institute in Germany, and Foundation Gaudeamus in Holland. Recordings of his music are available on New World Records, Periplum and Present Sounds Recordings. His namesake comes from Lord Byron and Ouyang Xiu (歐陽脩), two poets who wrote about love. Au Yong is an Assistant Professor of Music in Performing Arts & Social Justice at the University of San Francisco.